Many times when I tell my fellow clergy that our vestry meetings at St. Mark's are on Sundays at noon, they give me their sympathies. It is assumed that vestry meetings, by their very nature, are difficult meetings. People automatically think that vestry meetings are tiring, and to have them on Sundays after a morning of masses and formation classes must be exhausting. Truth be told, none of these assumptions are correct. Our vestry at St. Mark's meets once a month, usually on the third or fourth Sunday, and our meetings begin at 12:00 noon, typically ending between 12:45 noon and 1:30 pm. We always begin with lunch, as there is a sign-up sheet for three people to bring food for each meeting, and the food is always quite good. And the meetings are not all about finance and property, although finance and property issues can be exciting at times. We begin every meeting with approximately fifteen to thirty minutes of formation. This formation varies, as sometimes it is about the role of the vestry within the parish, sometimes it is about discerning St. Mark's mission, sometimes it is about deepening our Anglo-Catholic values, etc. The work of the vestry always begins with mission, ministry, or identity. The vestry is responsible for the finances of the parish, and this can be a burden at times, but overall the work is joyful and spirit-filled. For every serious discussion, we have many more laughs together. I am writing to you about the role of the vestry because as we approach the end of the year, we are currently discerning leadership roles for the parish. Every year three positions on the vestry are elected at the parish's annual meeting in January. We also elect a Junior Warden, and the rector appoints the Senior Warden. All vestry members must be baptized and confirmed members of the Episcopal Church and St. Mark's. It is also our practice that all vestry members are seeking to become better stewards of their financial resources. As your rector, it is my expectation that vestry members will be passionate about the ministries of St. Mark's. Vestry members should attend church every Sunday, they should be deepening their faith through practices such as Bible Study, outreach ministries, and/or the Daily Office, and they should have a deep love for our Anglo-Catholic identity. In other words, vestry members are good examples of what it means to love God with all our hearts, minds, souls, and strength, while also loving our neighbors with the same passion. Vestry members are disciples who are passionate for Jesus Christ. As I said earlier, we will be electing in January three people to the vestry, and one person as Junior Warden. If you are interested in serving in this capacity, and if you are willing to work hard for the mission of St. Mark's in partnership with me and others, please consider stepping forward. I promise that the work will be deeply rewarding. 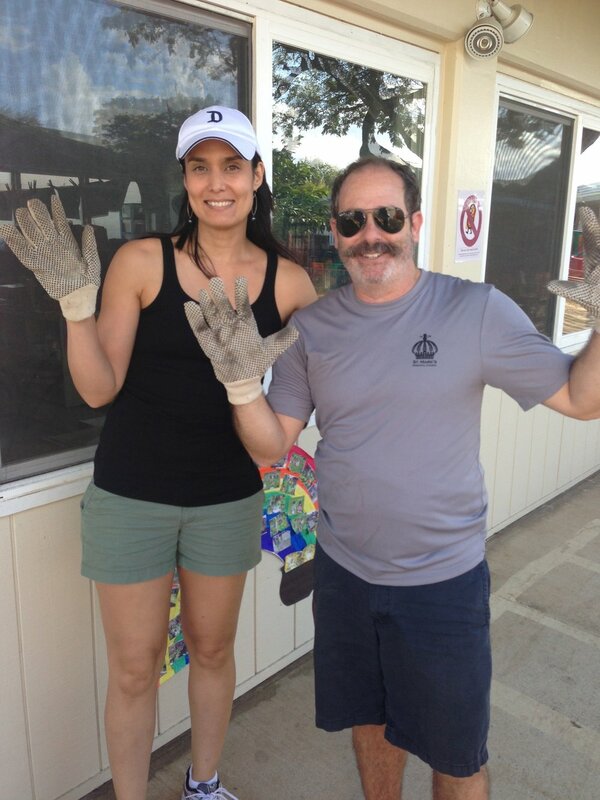 John Schamber and Susie Graeb pose for a photo during a vestry Service day dedicated to cleaning up Herbert Avenue behind the preschool building.